This recipe is slightly unusual as it requires 100% chocolate...i know...it's a little expensive... but i promise you, it's worth it! We have all read in the news papers and the glossy magazines how chocolate is great for us, so why not invest (yes i said invest as it costs about £6 for 3OZ of this edible gold) in the good stuff and indulge, once in a while on something that is so good for us? Hm... what do you say girls? 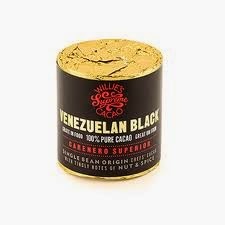 For this recipe I used Willie Wonka Chocolate Venezuelan Black which you can find in most UK supermarkets and gourmet delis but if you live out of the UK you can order it here. Please try this recipe on your pay day - it's worth it! In case you can"t find this type chocolate, substitute for 200 g of 70% chocolate, it works great too. For gluten free recipe, use rice flour or regular plain gluten free flour (I use Doves farm).